The Bradbury family, owners of The Historic Hill House and Farm, and the entire staff are focused on providing our guests with the ultimate guest experience. We employ a "Small Staff, Big Service" philosophy, focusing less on the size of the team and more on the quality and character of the team members. Each of our staff members brings significant experience to the team and is extremely passionate about the property and our singular mission to provide our guests with a memorable and unique experience. We commit significant time and resources to make sure that we have the highest quality people, products, service providers, systems, and facilities. We are sure you will be satisfied with the quality of our team. Michael Bradbury is a local entrepreneur and former investment banker. 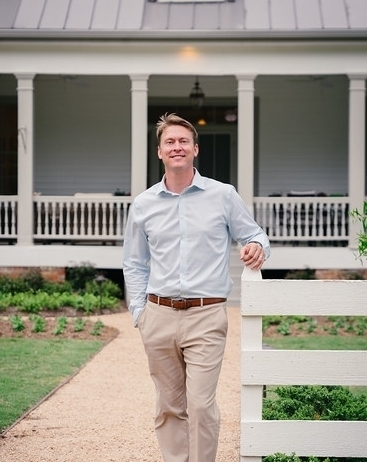 In addition to starting and operating The Historic Hill House and Farm, he owns Bradbury Brothers, one of the largest and most respected HVAC and Plumbing contracting companies in Montgomery County and 2015 Lone Star College Small Business of the Year. Michael lives in the Woodlands with his wife Annie Sadler Bradbury and their children Jack, Michael, and Berkeley. They are members of the The Woodlands United Methodist Church. In his spare time, Michael enjoys playing golf and soccer, reading (particularly biographies), traveling, and cooking. Michael received a B.A. with Honors from the University of California, Santa Barbara and graduated with an M.B.A. from Rice University. Prior to attending business school, Mr. Bradbury worked for the Committee on Ways and Means in the U.S. House of Representatives. Michael is an active and enthusiastic member of the community. He currently serves on the board of The Woodlands Rotary Club and is a recipient of its Paul Harris Fellow Award. He co-chairs the annual Mike Ogg All-Montgomery County Scholar Athlete Awards. He is a participant in Leadership Montgomery County (Class of 2018). He previously served as President of the Harris-Montgomery Counties Municipal Utility District Number 386. He supports and has been involved in a broad range of other charitable activities and organizations, including Big Brothers-Big Sisters, the Lymphoma and Leukemia Society, and the YMCA. Dennis Bradbury is an owner of The Historic Hill House and Farm and serves as the Property Manager. He is responsible for ensuring that everything on the property works and runs smoothly. He lives on-site and is available to address guest needs at any time. His diverse experience in construction and maintenance, along with a strong attention to detail, allows The Historic Hill House and Farm to always be in peak shape and ready for our guests to have a great experience. Dennis was intimately involved in the rehabilitation and restoration of the 1885 Main House and overseeing the other construction projects. As the Innkeeper at The Historic Hill House and Farm, Amanda brings a wealth of hospitality and guest service experience to the team. Amanda works diligently with each of our guests to assist with any questions about the property, facilitate any special requests, and to ensure our guests enjoy a five-star experience. Born and raised in Texas, Amanda knows this area intimately. When she is not at work, Amanda enjoys spending time with her four rescued pups and trying out new recipes. A native to California, Tori joined The Historic Hill House and Farm with over 30 years of experience in the food industry. Tori is responsible for the creation and execution of our fine dining program. Guests can expect to have an exceptional culinary experience including a casual and friendly breakfast and a more formal four-course dinner. Guests frequently ask Tori about her favorite dish to cook. She will tell you that her favorite meal to prepare is one that she has never made before. Tori has a passion for experimenting with new recipes, learning new cooking styles, and bringing joy to others through her cooking. Tori is able to accommodate a wide range of dietary restrictions and meal preferences. In her free time away from the farm, Tori can be found lost in a good book or spending time with one of her eleven grand-kids. Alexandra is responsible for all wedding and events at The Historic Hill House and Farm. From initial contact to event execution, Alex provides our guests with a smooth experience and delivers unique and memorable events. Her role also involves building The Historic Hill House and Farm’s brand by managing all social media platforms and marketing materials. Recently relocating from Pittsburgh, Alex brings to the team 10 years of customer service experience, coordination and execution of over 75 weddings and events, and a B.S. in Marketing Management. Alex is passionate about photography, design, and helping others. In her free time, she can be found in a local coffee shop, traveling to see family, riding bikes or playing with her two cats.